At the recommendation of some friends and Flavor magazine, we made reservations at the Farmhouse at Veritas Vineyards in Afton. 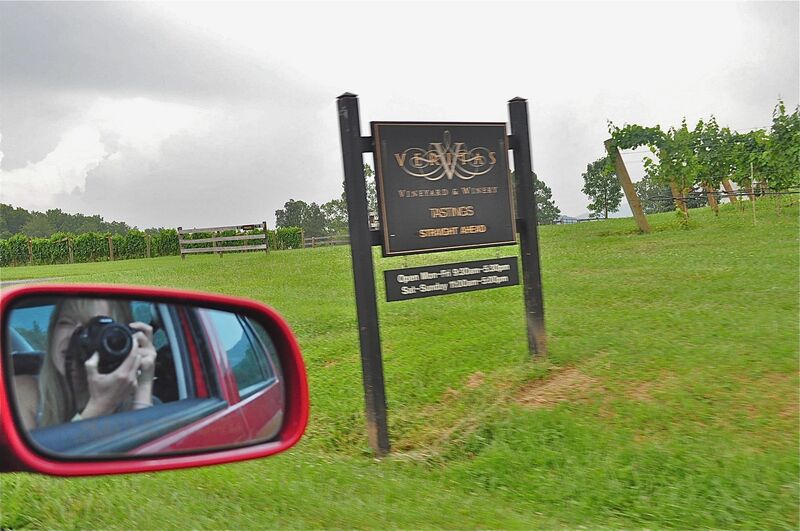 Our pastor’s wife was the first to suggest a stop at the oldest commercial winery in Virginia, Barboursville Vineyards, which we read in our wine literature was one of the best. 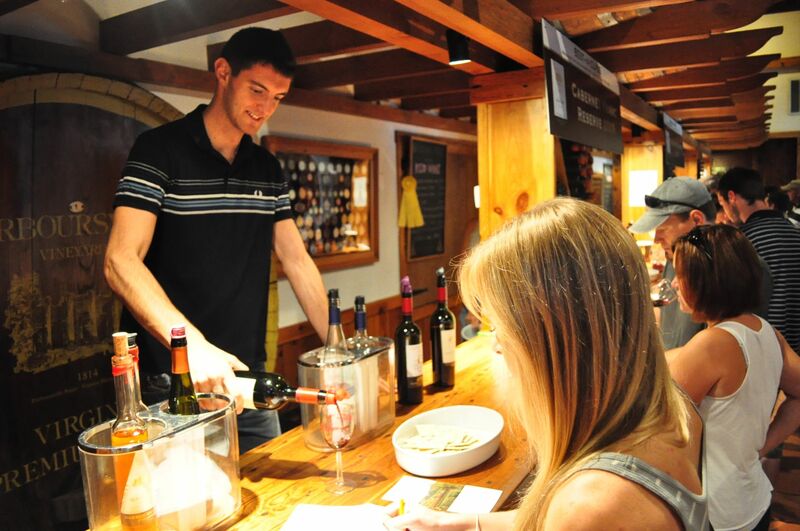 What may have swayed us in Barboursville’s favor the most, however, was that our tastings were being poured by a bonafide Italian, a nephew of the vineyard’s owner no less, named Matteo Zonin (pronounce Zo-neen). 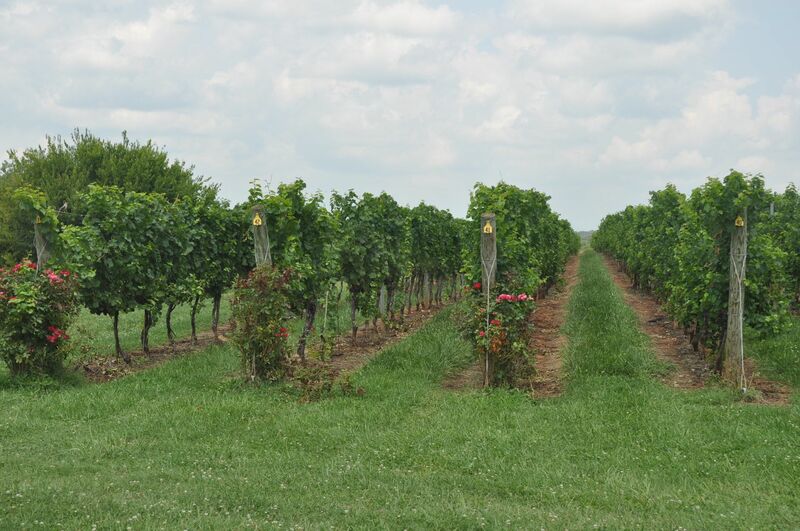 Matteo hails from Vicenza and a country where his family owns almost a dozen wineries. 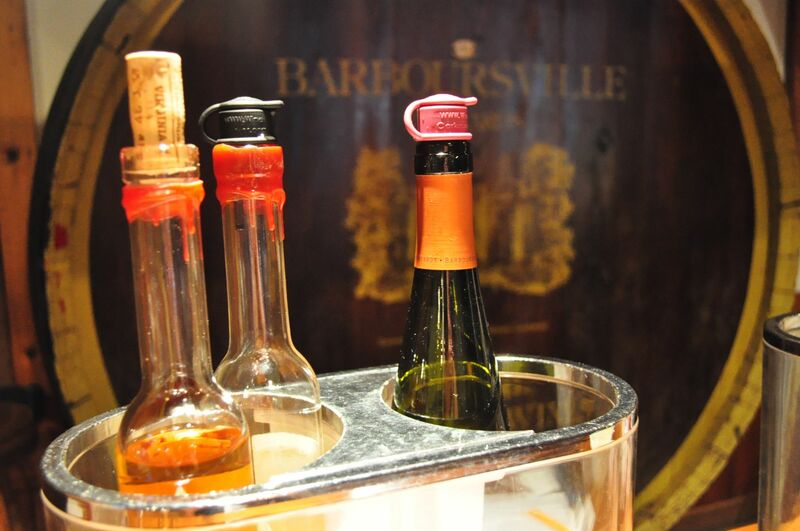 The Barboursvillle location is the Zonins’ only stateside location, started in 1976 “because my uncle wanted to have a winery in America,” Matteo said. Matteo is in Virginia only for the summer, on break from his studies in business to one day become, you guessed it, the owner of a winery in Italy. We chatted with him about our trip to Italy last summer and the devastating mudslides that took out our favorite destination, Cinque Terre, just a couple months after our visit. Can I just say that every sip of wine tastes a little better when its nuances are being described in an Italian accent? 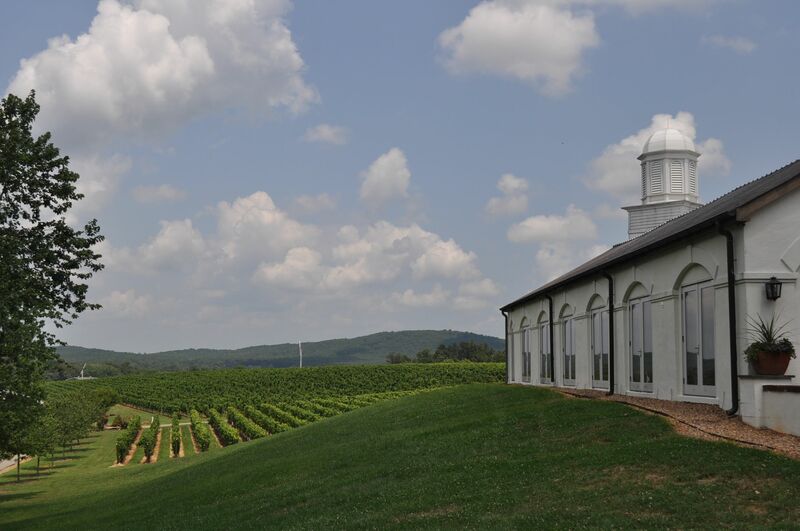 Not to mention that Barboursville has really exceptional wines. Its 2008 Octagon blend has received rave reviews and has been offered at the tables of President Obama, Queen Elizabeth and the Royal Wedding. We shamelessly accepted a second taste of the $50 bottle before opting for the less expensive 2007 Cabernet Sauvignon Reserve, which had us dreaming of steaks with the first sip. Next time we will have to stay for the acclaimed Italian dinner (or more affordable lunch) at the winery’s Palladio Restaurant. Molto bene! Wined up (splitting) tastes of 19 bottles, we headed for a dose of history and ogling at America’s Renaissance man at Monticello. This was my second time to Thomas Jefferson’s estate, and I must say it almost ruins by comparison our frequent visits to Mount Vernon, which is seven miles from our house. 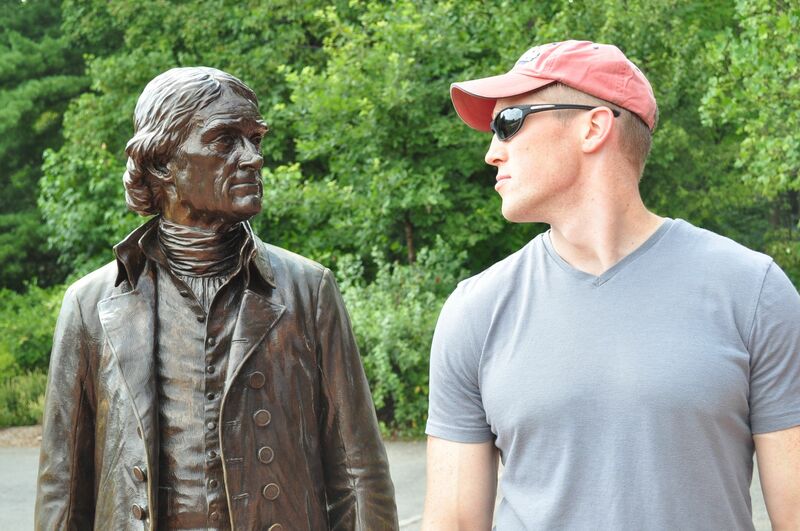 If I had to choose between Phelps and Lochte, I mean, Monticello and Mount Vernon, it’s TJ’s estate all the way. The pen behind the Declaration of Independence and founder of the University of Virginia, Thomas Jefferson holds a seemingly endless number of titles. And his house… incredible. 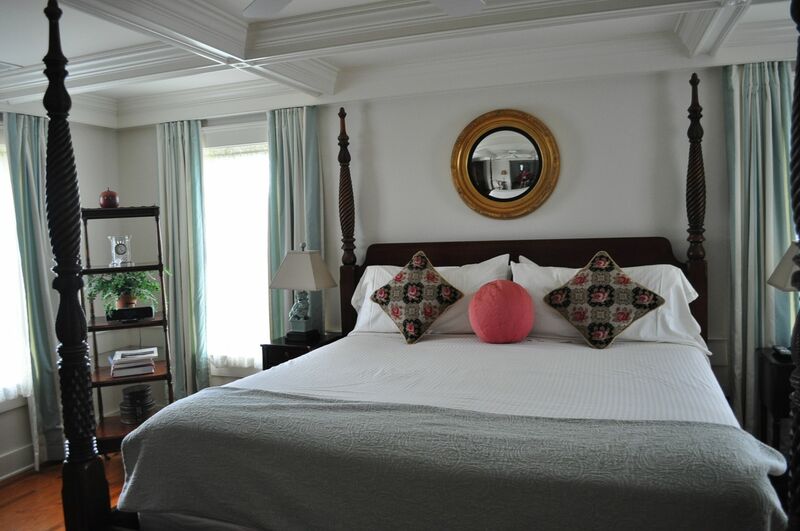 I would move in if I didn’t think the alcove bed would make me a bit claustrophobic. Go visit this summer and cross your fingers for the guide that’s a rising freshman at UVA — the most informed and gifted historian-of-an-18-year-old I’ve ever seen. He could name every one of the famous thinkers pictured in Jefferson’s meeting room. The story of Jefferson and John Adams, whose statue bust overlooks the bed, and their Independence Day deaths is a good one… I won’t spoil it here. The wine dumbwaiter that brought fresh bottles from the cellar to the dining room without a servant being present, an interruption to dinner conversation that Jefferson preferred to avoid. We heard later that Jefferson’s wine records revealed he once polished off 300 bottles of wine in a week with the help of a few house guests. So the man could either drink or he was an ardent pusher upon his guests. And this rundown doesn’t even include the gardens, the farm (Jefferson was, above all titles, a cultivator of the earth) and the slave quarters. 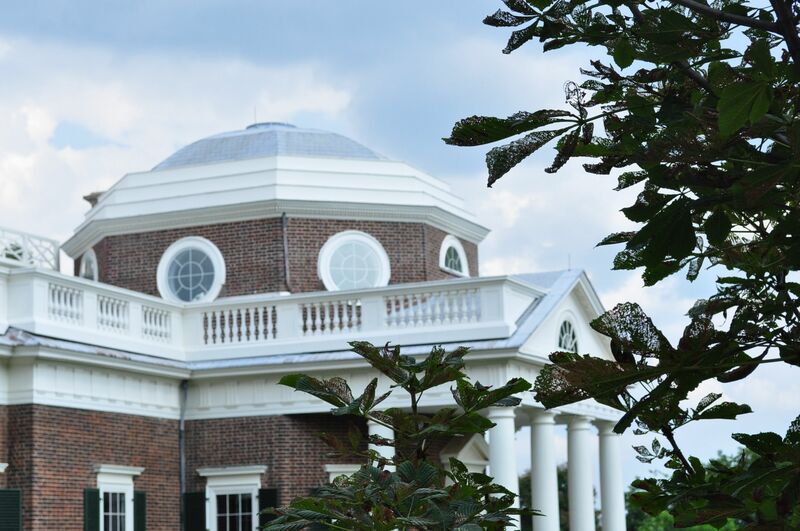 The grounds are just beautiful and offer a unique view, thanks to skillful tree-trimming, of the UVA rotunda from Monticello’s porch. After our history dose, we hurried off to the bed and breakfast in time for happy hour at the farmhouse. 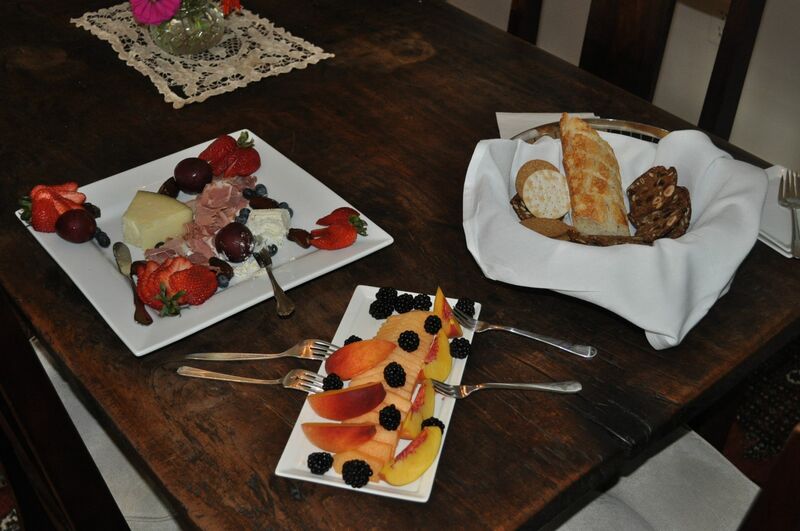 The fitting spread of snacks and wines was a wonderful welcome to the B&B, which opened to guests earlier this year. 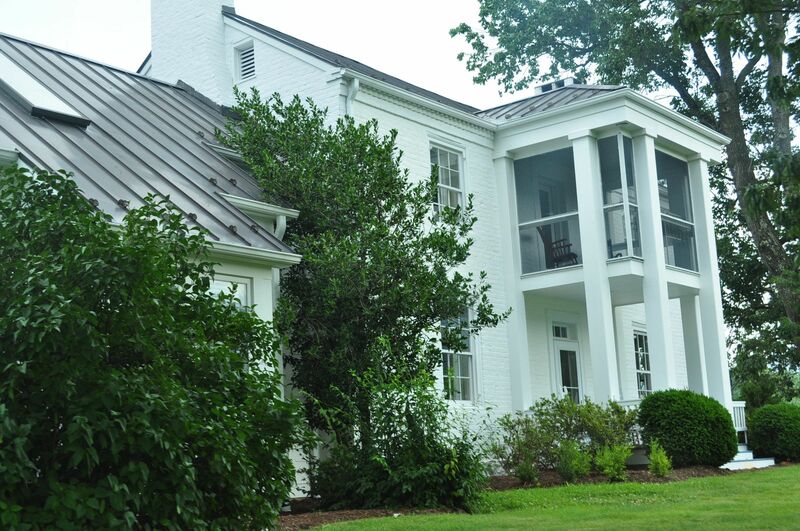 Our devoted host and farmhouse manager Drew gave us a tour of the six-bedroom home, built in 1836 and previously home to the wine owner’s family. The views of undulating hills covered in vines, wide open spaces and waking up to the Blue Ridge Mountains layered with fog… I highly recommend it. 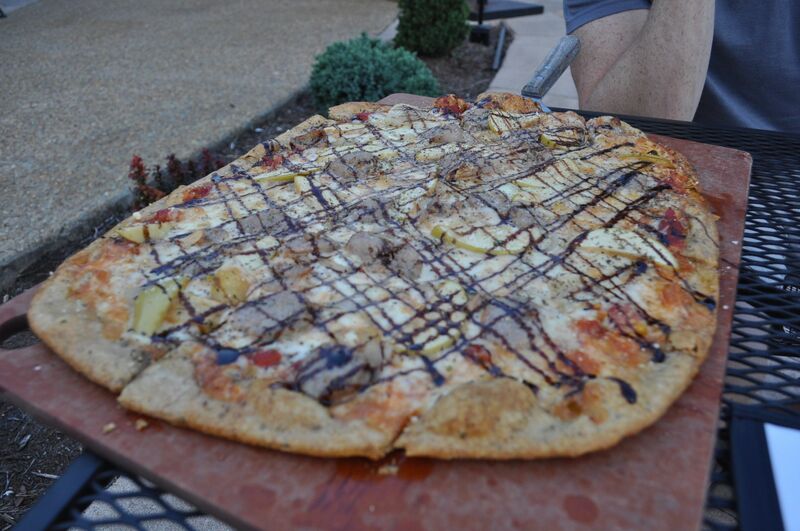 We conjured enough appetite to consume most of our pizza — a savory and sweet sausage, apple and onion combo with balsamic drizzlings — at Blue Mountain Brewery. We went for the spread of beer tastings, which included twice the number of tastings I was expecting. 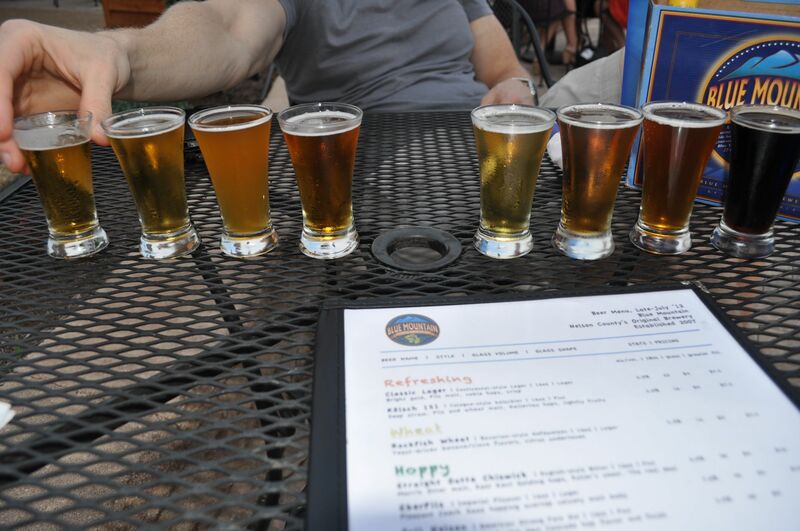 My preference is on the darker end and the real hoppy ones near the middle, well, we barely touched them. It wasn’t quite Northwest microbrews, but the price was right. And a seat on the patio offers the chance to supervise the breweries budding crop of hops, which was harvested the next day. OK, that’s pretty much it. Or the breakfast, which was nothing less than the culinary climax of our trip.